Levaquin And Shoulder Tendonitis, Will Surgery Help? I had sudden onset of left shoulder pain following use of Levaquin antibiotic in May 2008. MRI shows tendonitis, bursitis, rotator cuff tear and frayed labrum. It is now September 2009, I have had physiotherapy (4 different treatment programs) and 3 cortisone injections. Am waiting (months and months) to see a surgeon. Do you have any info about surgery for this type of problem. I don't have any information on surgery for this, right off hand. If the Levaquin caused the damage, and if that damage isn't going to heal, or not heal any time soon, I don't know how good of an idea surgery is. If Levaquin indeed causes DNA damage to the tendon and other connective tissue, the only way surgery is going to help is if ALL the affected tissue is carved out. If that's a lot of tissue, that's may be more removal than anyone would want. It depends on your case and specific circumstances. And, a quick search on Scholar.Google.Com didn't show me anything about the results of surgery for Levaquin Tendonitis or other Levaquin negative side effects. 1. How much Levaquin did you take? And, in what Levaquin dosage? 2. Did you have any symptoms in the shoulder before taking Levaquin? 3. Are your symptoms -any- better than they were? 4. BTW, Corticosteroid Injections are incredibly unlikely to help. Have any of the methods you've tried given any relief? 5. Levaquin pain and problem anywhere else in the body? Comments for Levaquin And Shoulder Tendonitis, Will Surgery Help? PART 2 - My response - Levaquin And Shoulder Tendonitis, Will Surgery Help? I was taking 500mg of levaquin for 10 days. I stopped after 7 days after sudden onset of severe pain. I do not have any other symptons elsewhere in my body. The pain is better than it was during the initial onset, but has gotten somewhat worse in the last few months. It is there every day, day in and day out. The first cortisone injection (December 2008) worked completely - removed all symptoms for 3 months, the second injection provided very little relief and the 3rd injection (into the tendon as opposed to the joint) provided a little relief. I have tried 4 sessions (6-10 appts at a time) over the last 1.5 years with no relief. Well, if you hadn't said 'sudden onset' I would lean towards that you have a particular dynamic in your shoulder that just coincidentally started to hurt. And that MRI shows so many structures in the shoulder as messed up....that gives me a little bit doubt it's Levaquin. Although, your shoulder might have already been going down that hurting direction, and for some reason the Levaquin targeted it because it was already injured (even though you didn't have any pain). Some people have pain all over, some people have very targeted pain and tissue degeneration. Hmmm. I can't diagnose, of course, but let me ask a few more questions. 1. Activity wise, what do you do with your body and shoulder? Are you active? Sedentary? 2. History of Shoulder use? Sports in your past, etc? 4. General state of health? Regardless, you have damage and pain. If it's from Levaquin cytotoxicity, that's much worse than if it's due to some other things, like maybe you have some nutritional deficiencies that your body turned into shoulder weakness and damage (which the Levaquin then could have been drawn to, or thereform affect it more). There a lot of variables, and unknown variables. I believe if we keep at it, we'll figure it out. Answer the above questions, and we'll go from there. PART 3 - My response - Levaquin And Shoulder Tendonitis, Will Surgery Help? Relatively sedentary - have had 2 spinal fusions for a burst fracture of L-1 in 1995. Have no history of shoulder problems and didn't participate in any sports that would cause problems. Coincidentally at the same time this problem developed in my L shoulder, I was undergoing physio for pain in my R shoulder caused by a rotator tear but have no idea why it happened. The R Shoulder problem was annoying more than anything else - it didnt cause me to overuse the L shoulder. The L shoulder was absolutely a sudden onset - went to bed and woke up with it. The only other thing is that at the same time I was diagnosed with carpal tunnel in both hands and I was quite conviced the shoulder pain was related - I had carpal tunnel surgery on L hand with good results but no improvement in shoulder pain. Shoulder pain is getting worse - while at the beginning I felt it more in my bicep-upper arm area it now affets my sleep due to pain in the shoulder and shoulder is very stiff in morning. Yes Canada, I have a bunch of thoghts. But one more question. Was the burst facture in the spine from an impact accident like a car accident? Or did it just 'happen? PART 4 - My response - Levaquin And Shoulder Tendonitis, Will Surgery Help? In answer to your question, the burst fracture (L-1) was the result of a car accident in 1995. I had emergency surgery with a posterior fusion, one year later the rods and pins were removed and the fusion collapsed, resulting in another fusion - anterior - with the placement of a permanent plate. I dont think the spine surgery has caused the shoulder problem - but you never know. Well, I have to say, I'm having a hard time getting a picture of what is Levaquin caused and what was already happening. It's tough to tell partly because of your pre-existing pain and such. So I'll just give you what I think at this point. 1. One component of the connective tissue degradation and inability to heal (with the fusion collapsing being a clue) is that you are almost certainly Vitamin D deficient. How deficient, I don't know. For instance, make sure you get D3 and not D2. 2. 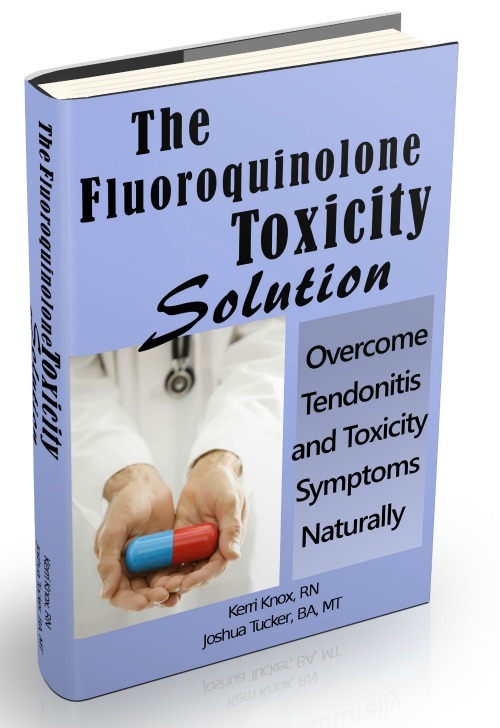 If you do have Levaquin Tendonitis and cytotoxic damage, I suggest this The Levaquin Tendonitis Solution ebook. It has lots of information and a plan to follow. Everything I suggest below may help, but due to the kind of damage Levaquin delivers, it's more about the health of the system, as opposed to a Tendonitis level of damage. C. Increase your intake of water. D. Get your Vit D levels up (this will help your system against the upcoming flu season too, least among many other benefits). E. If you can find a good massage therapist, especially one that has good training and experience, it's worth it. Massage can't really help directly with bursitis and damage to the inside of the joint, but it can do a lot to relax constriction on the outside of the joint that is in fact compressing the joint. F. The more you can ice the painful areas, the better. Massage the shoulder area with a frozen water bottle. Lean against it against a wall, or on the floor, however you can get cold and pressure onto the shoulder area. The How To Reduce Inflammation will give you some more info and ideas about that. PART 5 - I am back! Joshua. I had surgery in April (almost 2 years) after original sudden onset. Bicep tendon was torn and had adhered to rotator cuff. Surgeon performed tenotomy. Had short period of time after without pain - but it came back - exactly as before. Then I suddenly developed a sudden intense pain - that affected my ability to move my arm. Just like the original sudden onset in 2008- it came on fast and then after a few weeks diminished in intensity which I still have. Well, it's not at all surprising that pain didn't come back. Well, over distance...I think that while Levaquin may have been a factor for the beginning of all this, it doesn't -sound- like it's currently the major factor. Having said that, it makes sense that the Levaquin seriously depleted various nutrients, primarily Magnesium. It doesn't sound like you're 'falling apart', it sounds like you're tightening up and therefore getting pain. Levaquin is more of a 'tendons' falling apart. Magnesium deficiency is absolutely a 'tightening up'. To see where you're at now, did you follow some/any of suggestions A-F in the last conversation? Hi Joshua. I followed everything you suggested but no improvement. It has now been 2.5 years since this sudden onset. Overall I have had 6 cortisone injections - of which 2 worked completely. These 2 periods are the only times in 2.5 years that the pain has gone away. I see surgeon again next week - any suggestions for questions to ask ? So, 2 of 6 Corticosteroid injections took the pain away totally, temporarily. Unfortunately, that's bad effectiveness statistics, and you can't keep getting injections, as I'm sure you've been told. Here's the thing with surgery: If you have actual rippage and tearage, or if the inner lining of the shoulder joint is torn and...ragged, or has a ridge poking up, then it may be an ok idea to get in there and clean it up. The body will kick in a 'healing' response. Will that response help? Hopefully. You may want to get Kerri's The Levaquin Tendonitis Solution ebook. I gave you some tips and such. Kerri's ebook contains everything we've learned since then, and has a comprehensive plan. If what's in there doesn't help your body turn things around, I don't know what will. So. Either you body hasn't had what it needs nutritionally, or enough of it, to allow it to outheal the Levaquin cytotoxic damage, and/or the original damage made your connective tissue literally fall apart, and surgery -may- clean it up enough to help you heal back and not have so much pain. Which would be a good thing, but the systemic 'ecology' won't be affected. I don't know if that helps. I wish I could give you more specific answers. You need to get as specific as possible answers from you surgeon. 1. How exactly will the surgery help my pain go away. 2. What exactly is the damage that's already in there that you think surgery will clean up and make better. 3. How well will my body heal from the surgery? 4. How invasive is the surgery? 5. What will my after care look like so I can heal optimally? I had rotator cuff surgery on right shoulder December 2009. In January 2011, same shoulder started hurting just as badly as before. Surgeon operated again just in April 2011, he said my rotator cuff looks so badly and this is my last chance. If it doesn't heal, he is out of options. This is at the Mayo Clinic. He doesn't know about the Levaquin I took but he told my husband he had never seen anything like this. Now my knees are hurting really badly, especially the right knee. Your body can't heal if it doesn't have all the nutritional building blocks that it needs to operate properly. And if you have connective tissue DNA damage, you need your body OPTIMAL so you can outgrow bad tissue with good tissue. Bone tissue included. What have you done to help your body heal? This story starts out in November 2011 I had surgery to remove an intraductal papilloma in my breast and one year later November 2012 I have a place open up in my incision scar and its draining bloody pus. I seek medical advice and for four months I have been takin strong doses of antibiotics including three rounds of levaquin and two of cipro the last week I have been hurting all over to the point I can't sleep from my neck to my ankles. Today I went to my family practioneer and she's doing blood work but my pharmacist thinks it may be the antibiotics I know I have to fight the staph but I feel like this cure is killing me. They keep pumping you full of antibiotics, and they don't look at bolstering your immune system (because they don't do that). 1. Get your Vitamin D level tested and then get it up to 60-80 ng/ml. Vitamin D is a major factor in immune system function. 2. Stop eating ALL GLUTEN. NONE. NADA. 3. Do you have symptoms from the levaquin other than impaired healing? Muscle and/or joint pain, anxiety/panic/claustrophobia/etc, brain fog, etc?